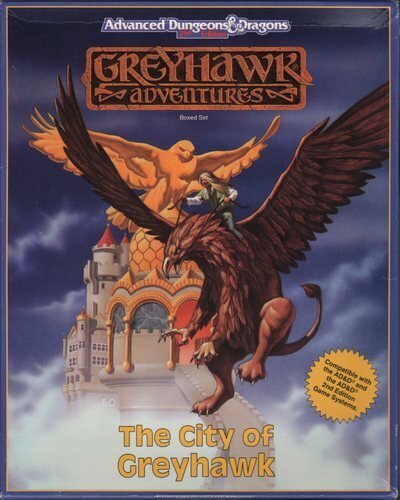 Buy The City of Greyhawk from Amazon or take a look at the other Greyhawk supplements on RPGNow. You too can earn money from writing articles by signing up for InfoBarrel. Credit: Erik Olson/TSR/eGDC LtdThe City of Greyhawk boxed set is a supplement and citybook for the Advanced Dungeons & Dragons 2nd Edition role playing game published by (originally) TSR. The World of Greyhawk is one of the oldest role-playing game settings in existence (although the commercially available world is different to the original campaign world, Gary Gygax's own campaign setting), and this is one of the oldest role playing game cities, but it wasn't until Gygax was forced out of TSR that the city was actually covered in a supplement, and not by its original creator. 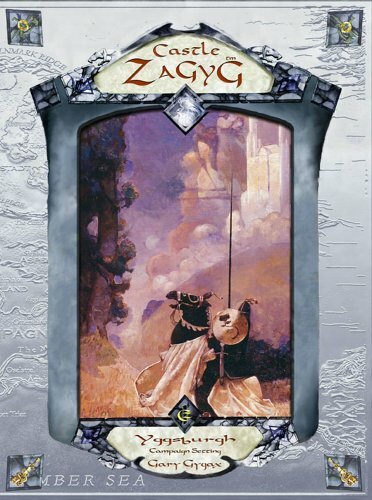 Gary Gygax did publish a version of the city at a later date, which was intended to be the first in a series of books, entitled Castle Zagyg Volume One: Yggsburgh. Two 96 page perfect bound softback books. 23 A4 colour adventure cards. 1 A4 monster statistics summary. This 96 page book was authored by Carl Sargent (who also did the Warhammer City supplement for WFRP) and Rik Rose. It primarily covers non player characters (NPCs) and the various factions they belong to. The Free City of Greyhawk is a city in which the Thieves Guild is very influential, with members holding many important government positions. The Introduction covers how NPC descriptions are handled in the book. Economics and Politics, The Military and the Law, Mages and Priests, The Guilds of Greyhawk, Low Life and Entertainment in Greyhawk each give details on NPCs relevant to that chapter, as well as factions and other appropriate information. It Takes All Kinds includes more NPCs that aren't in any of the previously covered areas, and the final section, Adventures, has four adventures set in the city. This 96 page book was written by Douglas Niles. This book is a gazetteer which covers the area outside the walls of the Free City, referring to the A1 map of the local area, to the city itself, both within and underneath it, referring to the other two A1 maps. The Gem of the Flanaess gives a brief overview of the city and its importance in the World of Greyhawk. The second chapter, DM's Guide to the City Campaign, covers using the boxed set and running a city campaign in general. Chapter 3, Territory Surrounding Greyhawk, is a guide to the labelled A1 map of the area surrounding the city. City Walls and Beyond describes the area immediately surrounding Greyhawk from the second area map, as well as the city's walls. The next chapters cover the city itself by district, area or quarter. These are The Grand Citadel, The High Quarter, Markets and Gardens, Clerkburg - The Halls, The Artisans' Quarter, The Foreign Quarter, The River Quarter and The Old City. Each chapter describes some details of the area as well as several important or interesting locations in it. Only The Grand Citadel has any maps of the buildings described. The next chapter, The Undercity, covers the area underneath the city as shown on the final A1 map. There is an Appendix, The Grapevine, which details rumours that players can come across in Greyhawk. The 23 adventure cards each describe a short adventure, both those set in and around this city, and those set further afield but which could be started from the city. Eight of the adventures specify that they are set in Greyhawk and another is set in a tavern. The remainder are set in a variety of different terrains. Three of these A1 colour foldout posters are maps. There is one of the surrounding area near to Greyhawk, an overground map of the City of Greyhawk and a map of the undercity. The final poster is an illustration of Greyhawk. All are in colour. This supplement references the ill-received AD&D First Edition module Castle Greyhawk, covering the dungeons of Castle Greyhawk which were one of the first RPG dungeons developed, rather than later versions of the castle such as Greyhawk Ruins. These are only fairly minor, and can easily be ignored or changed. There are references, especially for some of the NPCs, to more details in the Greyhawk Adventures hardback book, but there is still enough detail provided in this supplement to get around that if required. Excluding the adventure cards, there are very few locations in Greyhawk that have a full floorplan. City supplements vary between having lots of detailed building floorplans, and very few of them, with little in-between. With the adventure cards and the adventures in Greyhawk: Folk, Feuds, and Factions, as well as all the NPC, city and faction details, there is enough material to generate a decent campaign, if the material is fleshed out into adventures. This is one of the more detailed citybooks available which is not as linked to the World of Greyhawk as might be initially thought. There are references to other countries, organisations and deities of the world which could be replaced with comparable ones on another campaign world. Using the supplement with another game system will require extensive reworking of the NPCs, but they do all have detailed descriptions, which should make conversion a bit easier. As such, it is reasonably easy to add this city to other campaigns. At the time of writing, this is not currently in print, but Wizards of the Coast are releasing various Greyhawk supplements on RPGNow, so it seems likely that a PDF version will be available at some point. The City of Greyhawk boxed set is one of the better city supplements around.